For those over in the good old US of A that prefer the AT&T network as their carrier of choice, and are in the market for a slice of that fruity operating system known as Windows Phone Mango, you might just like to know that you can now purchase the Samsung Focus 2 on AT&T. According to the guys over at Engadget, AT&T placed the Samsung Focus 2 officially up for sale yesterday the 20th of May and thus delivering another choice of Mango along with LTE rather than the Nokia Lumia 900. Here’s a quick spec reminder for those that might have forgotten, the Samsung Focus 2 offers a 4-inch WVGA Super AMOLED touch screen along with a 5 megapixel auto-focus camera, 720p HD video, VGA front facing camera, a 1.4Mhz single core processor, Bluetooth, WiFi, 8GB internal memory, 4G LTE connectivity, runs Windows Phone 7.5, has a 1750mAh battery, measures 4.79 x 2.47 x 0.43-inches with a weight of 4.3 ounces. 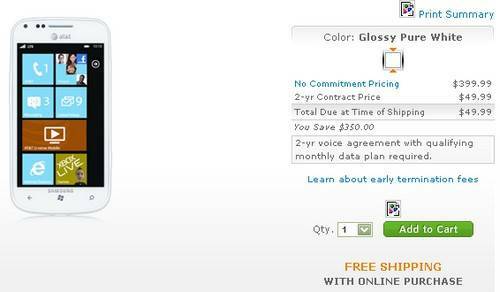 For those that would like to own the Samsung Focus 2 on AT&T, unfortunately you don’t get a colour option with the Windows Phone handset, as the device is only available in glossy white; however the Samsung Focus 2 does command an attractive price point at just $49.99 when signing on for the usual two-year agreement of course. So there you go, if you have been waiting for the Samsung Focus 2 to become available from AT&T you can now grab it, will any of our readers be picking up the Focus 2 from AT&T?